When you are getting very low visits on your business website or blog, its mean people are unable to find your online presence through search engines and improper selection of keywords could be the root cause behind this problem. That’s why experts always suggest the use of a best keyword research tool for SEO when you want to do SEO for a client or for your own website. Since it is known as by every expert that Google uses keywords as a vital ranking factor when it decides the ranking of websites, you must be cautious regarding the selection of keywords for seo campaign or to write an article that you want maximum people to read. As people who are searching on the web, only find you of Google thinks that your content is relevant to the queries for which people are searching and this is the major reason behind the significance of keyword research for search engine optimization. So as to, if you want more clicks on your blog link, you have to add exact terms in your content naturally that people are typing in search engines to find what they want. Keyword research tools are handy to use when it comes to write a blog post or to kick-start SEO campaign because they show you what keywords you can rank easily in search engines to get high ranks for your blog or website. So, if you want search engines to send more traffic, have a glance at following best keyword research tools for SEO and pick the best one up for your content creating strategy. One of the most commonly used and popular keyword research tools available over the web. The basic reason behind its popularity is that it’s totally free to use and directly integrated with Google AdWords and provides authentic results for each query. In order to get started, you just need a Gmail account (if don’t have one, simply create one for free) and make the process of keyword research more efficient and easier as well. You would also love to use this amazing keyword research tool powered by Google because it provides deep information and data offered by the Google. For beginners, Google Keyword Planner is great but if you want in-depth keyword research data based on various factors, you must go with another advanced one from the list of best keyword research tools for SEO in order to get a detailed and competitive analysis. 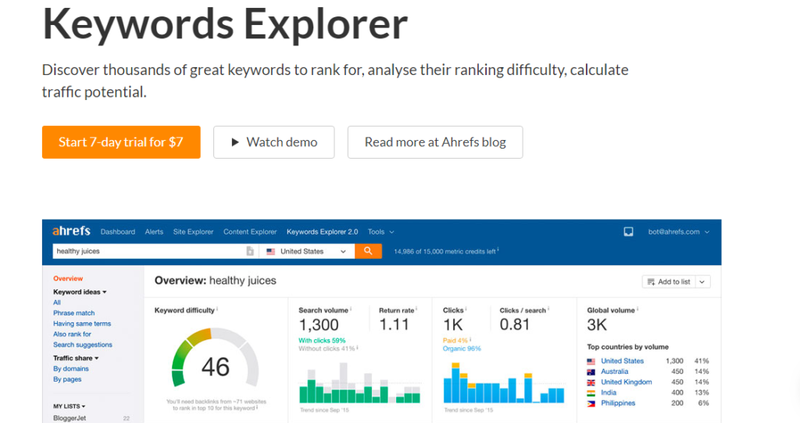 Basically, Ahrefs is an online company with a huge collection of SEO tools and their keyword explorer is an amazing keyword research tool for SEO around the world and billions of people are using. All you need to do is creating an account there and log in to the account using your details and navigate to the Keywords Explorer section. By typing your favorite topic or keyword in the search box, you can have up to 100 options there for an authentic and perfect keyword research. You can choose your favorite country from there in options because they get and include data for your keyword research from several countries. After that, you will able to see important metrics for your favorite keywords such as monthly search volume, competitiveness, traffic potential, and LSI keywords etc in order to get something great in results. A brilliant and one of my favorite keyword research tools ever. It provides you great keyword research results along with information on keywords for both PPC and organic traffic to find out that what keywords would be fruitful for you either to get high ranks or to get high PPC rate. SEMrush is an amazing keyword research tool for SEO that offers both short and long-tail keyword research for its users. SEMrush also shows that how many searches different keywords are getting, whether the searches are paid or free and what the CPC Adwords price each of them has. Nothing can better than SEMrush when it comes to check the competition of keywords you are about to work on. A lot of digital marketers are also using SEMrush to spy on competitors in order to beat them in SERPs by making foolproof marketing strategies. It is a cloud-based keyword research software and famous among beginners and experts as well. It could be a great tool for you to find out find amazing and easy to rank keywords for your niche/micro-niche sites. It sounds like a ‘Freemium’ keyword research tool and they provide really authentic and amazing results with keyword analysis feature if you are a ‘platinum’ member of longtailpro. Keyword competition checker is one of the great features of this tool that helps you find that how difficult it would be for you to rank a specific keyword in search engines. KWfinder is the right choice for you if you are looking for a best keyword research tool for SEO which is completely dedicated to Keyword research only and provides bona fide results as well. Since it is the new tool in the digital marketing industry, yet they are one of the fastest growing SEO tool company with a strong customer & fan base. It is functional with some free and premium plans that suit all your needs when it comes to find out keywords that drive more traffic and leads as well. KWfinder is a superb keyword tool to find longtail keywords that are great to help your articles rank higher in search results. When you are struggling to discover new keywords for your new blog or website, it could be an outstanding choice for you. Since finding the right and favorable keywords is one of the major concerns about creating a blog that you must take good care of, you can consider this keyword research tool as a great way to chase your keyword research objectives. 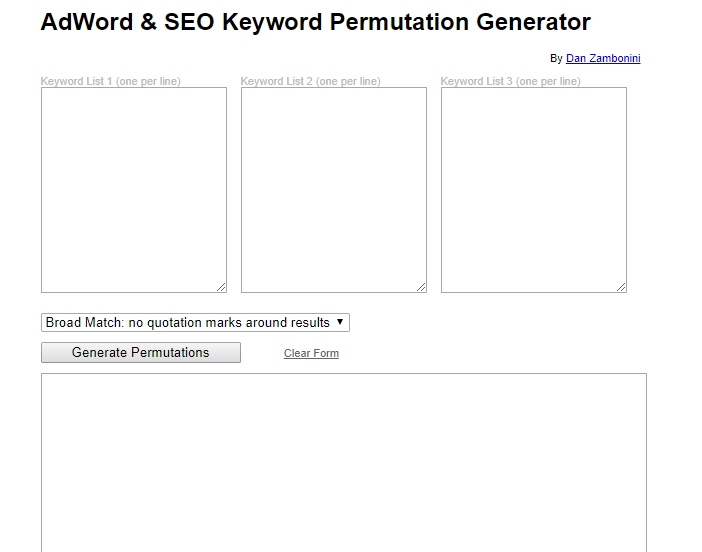 With this amazing AdWord & SEO Keyword Permutation Generator keyword tool, it would be simple and easier for you to get creative as you search for keywords that bring into line with your site niche, SEO strategy, and marketing objectives etc. With help of this best keyword research tool for SEO, its time to get creative when it comes to find keywords that are going to drive more traffic. All you need to do is that enter a keyword in each of three boxes available on the page, click on “generate permutations” and see the magic happen on your way of finding best keywords.